This recipe is a take on the popular classics of chicken schnitzel and 'surf-and turf', to satisfy the most hard-core pub goer. 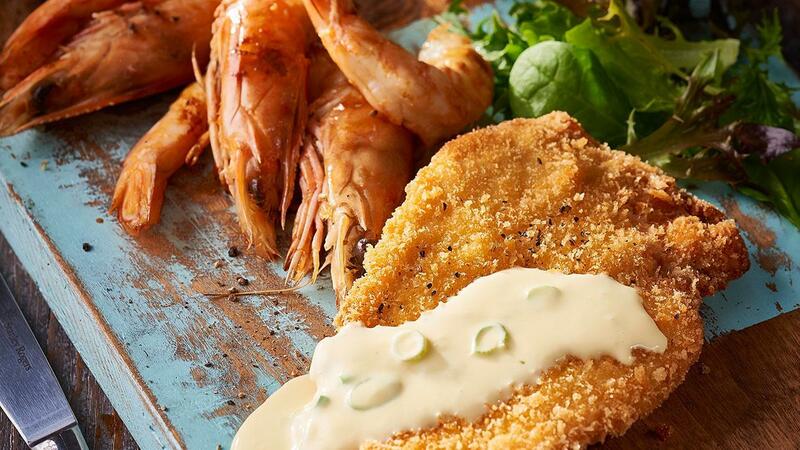 A combination of hand-crumbed chicken breast, succulent jumbo prawns and a creamy garlic sauce is a perfect marriage. KNORR Concentrated Liquid Stock, added into the sauce, lifts the flavour of the other ingredients and delivers that sought after umami flavour. Slice chicken breast fillets in half and flatten with a mallet. Add KNORR Concentrated Liquid Stock to the egg mix. Coat the chicken in flour, then egg mix, then in crumbs. Set aside to deep fry. Peel the prawns leaving the head and tail on. Grill on the barbecue. Combine the cream, KNORR Garlic Puree and KNORR Concentrated Liquid Stock together and slightly reduce, add chopped shallots. Serve together with the sauce on top, fresh fries and salad on the side. Garnish with fresh herbs.